This Directive lays down, without prejudice to the adoption of the list laid down in Article 2 (3) of Directive 81/851/EEC, the conditions other than those of animal health, governing the preparation, placing on the market and use of medicated feedingstuffs within the Community. This Directive shall not affect Community rules applicable to additives used in feedingstuffs, or national rules adopted pursuant to the said rules, and in particular those applicable to the additives entered in Annex II of Directive 70/524/EEC (8), as last amended by Commission Directive 89/583/EEC (9). For the purposes of this Directive the definitions appearing in Article 1 (2) of Directive 81/851/EEC and Article 2 of Council Directive 79/373/EEC of 2 April 1979 on the marketing of compound feedingstuffs (10), as last amended by Directive 90/44/EEC (11), shall apply as necessary. ‘placing on the market’: the holding in the territory of the Community for sale or disposal in any other form whatever to third parties, whether or not for consideration, and actual sale or disposal. 1. Member States shall prescribe that, as regards the medicinal component, medicated feedingstuffs may be manufactured from authorized medicated pre-mixes only. 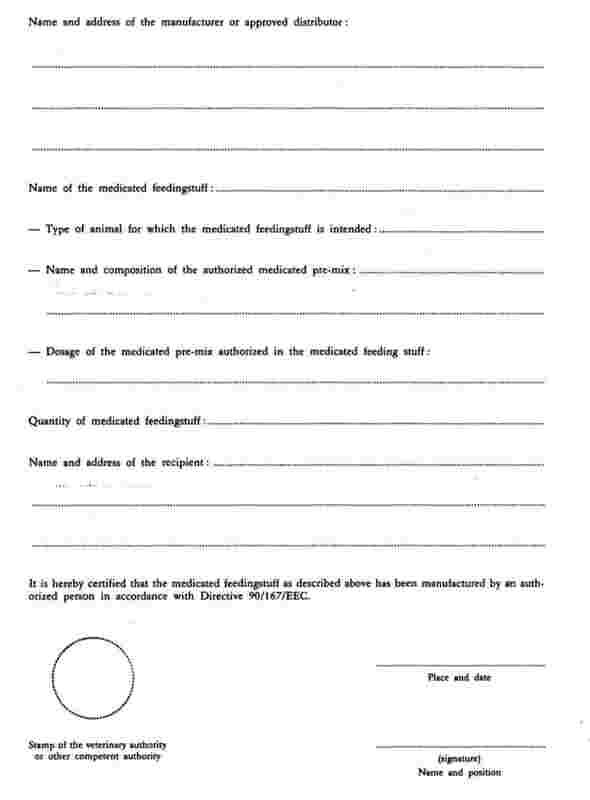 subject to any specific conditions laid down in authorizations to place authorized medicated pre-mixes on the market, authorize intermediate products which are prepared from such medicated pre-mixes authorized in accordance with Article 4 of Directive 81/851/EEC and from one or more feedingstuffs and which are intended for the subsequent manufacture of medicated feedingstuffs ready for use. authorize the veterinarian to have manufactured under the conditions laid down in Article 4 (3) of Directive 81/851/EEC, and under his responsibility and on prescription, medicated feedingstuffs from several authorized medicated pre-mixes, provided that there is no specific authorized therapeutic agent in pre-mix form for the disease to be treated or for the species concerned. Until the date on which the Member States have to comply with the new rules laid down in Article 4 (3) of Directive 81/851/EEC, national rules governing the above conditions shall remain applicable, with due regard for the general provisions of the Treaty. 2. Products authorized pursuant to paragraph 1 shall be subject to the rules laid down in Articles 24 to 50 of Directive 81/851/EEC. pre-mixes and medicated feedingstuffs shall be stored in suitable separate and secured rooms or hermetic containers which are specially designed for the storage of such products. 2. Member States may, by way of derogation from paragraph 1, subject to any additional guarantees appropriate, authorize the manufacture of medicated feedingstuffs on farms provided that the said paragraph is complied with. 1. Member States shall prescribe that medicated feedingstuffs may be placed on the market only in packages or containers sealed in such a way that, when the package is opened, the closure or seal is damaged and they cannot be re-used. 2. Where road tankers or similar containers are used to place medicated feedingstuffs on the market, these must be cleaned before any re-use in order to prevent any subsequent undesirable interaction or contamination. 1. Member States shall take all necessary measures to ensure that medicated feedingstuffs are not put into circulation unless the labelling complies with the Community provisions in force. Furthermore, the packages or containers referred to in Article 5 (1) shall be clearly marked ‘Medicated Feedingstuffs’. 2. Where road tankers or similar containers are used to place medicated feedingstuffs on the market, it shall be sufficient for the information referred to in paragraph 1 to be contained in the accompanying documents. 1. Member States shall take ail necessary measures to ensure that a medicated feedingstuff cannot be held, placed on the market or used unless it has been manufactured in accordance with this Directive. 2. Subject to the requirements of Article 4 (2) of Directive 81/851/EEC with regard to the tests to be carried out on veterinary medicinal products, Member States may, however, for scientific purposes, provide for derogations from this Directive, provided there is adequate official control. medicated feedingstuffs may not be used for more than one treatment under the same prescription. satisfy himself that the medicated feedingstuff and the feedingstuff currently used to feed treated animals do not contain the same antibiotic or the same coccidiostat as active substances. the medicated feedingstuffs accorded such authorization are used in their territory only prophylactically and in the dosages necessary for the purpose in question. Member States applying such a derogation shall inform the Commission and the other Member States thereof within the Standing Veterinary Committee, before the date provided for in the first indent of the first subparagraph of Article 15, specifying in particular the nature of the medicinal products and animal species that it covers. Not more than six months before the expiry of the five-year period laid down in the first subparagraph the Commission shall report to the Council on the risks associated with the use of these groups of substances and may include proposals on which the Council will decide by a qualified majority. 3. 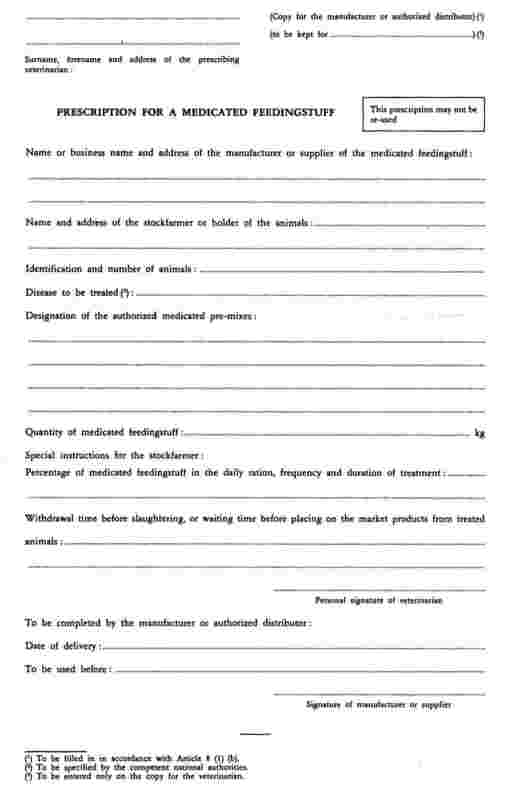 Where medicated feedingstuffs are administered to animals whose meat, flesh, offal or products are intended for human consumption, the stockfarmer or holder of the animals concerned must ensure that treated animals are not slaughtered in order to be offered for consumption before the end of the withdrawal period and that products obtained from a treated animal before the end of such a withdrawal period are not disposed of with a view to their being offered for human consumption. 1. Member States shall take all necessary measures to ensure that medicated feedingstuffs are issued directly to the stockfarmer or holder of the animals only by the manufacturer or distributor specially approved by the competent authority of the Member State of destination. they are not issued in quantities greater than one month's requirements as established in accordance with the stipulations of the first indent. may supply only prepacked or prepackaged medicated feedingstuffs ready for use by the holder or stock-farmer that have on the packaging or containers instructions for the use of the said medicated feedingstuffs and, in particular, an indication of the withdrawal period. 3. The provisions of paragraph 2 shall not affect national rules on the legal ownership of the medicated feedingstuffs. subject to the specific provisions of Council Directive 86/469/EEC of 16 September 1986 concerning the examination of animals and fresh meat for the presence of residues (12) and Council Directive 88/299/EEC of 17 May 1988 on trade in animals treated with certain substances having a hormonal action and their meat, as referred to in Article 7 of Directive 88/146/EEC (13), in animals to which those medicated feedingstuffs except those produced pursuant to the second subparagraph of Article 3 (1), have been administered, or in meat, flesh, offal or their products from such animals. 2. Where the application of paragraph 1 gives rise to dispute, in particular as concerns recognition of the similar nature of the pre-mix, the Member States concerned or the Commission may submit the dispute to assessment by an expert appearing on a list of Community experts to be drawn up by the Commission on a proposal from the Member States. If the two Member States so agree beforehand, the parties shall abide by the opinion of the expert, in compliance with Community legislation. 3. The Member State of destination may require that each consignment of a medicated feedingstuff be accompanied by a certificate issued by the competent authority, corresponding to the specimen form in Annex B. 1. The safeguard measures laid down by Directive 89/662/EEC shall apply to trade in authorized medicated pre-mixes or medicated feedingstuffs. 2. The rules laid down concerning veterinary control and, in particular, the requirements laid down in Article 5 (2) and Article 20 of Directive 89/662/EEC shall apply to trade in authorized pre-mixes or medicated feedingstuffs to the extent that they are subject to veterinary control. The Council, acting by a qualified majority on proposals from the Commission, shall adopt any amendments and additions to be made to this Directive. in particular, by making sampling checks on farms and slaughterhouses, that medicated feedingstuffs are used in compliance with the conditions of use, and that withdrawal periods have been complied with. Pending the implementation of Community measures relating to imports of medicated feedingstuffs from third countries, Member States shall apply to those imports measures which are at least equivalent to those of this Directive. before 1 October 1991, with the other provisions of this Directive. Done at Luxembourg, 26 March 1990. OJ No C 182, 8. 7. 1983, p. 7. (2) OJ No C 128, 16. 5. 1983, p. 76. (3) OJ No C 114, 6. 5. 1982, p. 17. (5) OJ No L 317, 6. 11. 1981, p. 16. (6) OJ No L 15, 17. 1. 1987, p. 34. (7) OJ No L 395, 30. 12. 1989, p. 13. (8) OJ No L 270, 14. 12. 1970, p. 1. (9) OJ No L 325, 10. 11. 1989, p. 33. (10) OJ No L 86, 6. 4. 1979, p. 30. (11) OJ No L 27, 31. 1. 1990, p. 35. (12) OJ No L 275, 26. 9. 1986, p. 36. (13) OJ No L 128, 21. 5. 1988, p. 36.